IT proved one of the roughest Classic finals ever, but Razldazl George underlined “the toughness” that his trainer Dolores Ruth is so proud ofwith a battling performance that saw him deprive Dream Walker of victory with a last gasp short head surge in the final of the Ladbrokes.com Irish Derby at Shelbourne on Saturday. 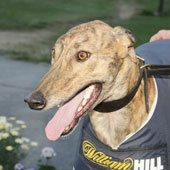 Kennelmate Razldazl Bugatti, trapped and moved wide early, hampering among others ‘Gorgeous George’. It looked to hand the race to heavily backed favourite Rockchase Bullet, who also went up fast on the outside, but then collided with Razldazl Bugatti on the first and second bends, where Razldazl George and the rest of the field bunched up as well – with the exception of rank outsider Dream Walker, trained by Tom O’Neill, brother of Jonjo. He had found himself behind early, but got a lovely path on the inside and shot through into a clear advantage. Razldazl George turned in pusuit, and to enormous cheers from the packed house, got up by the minimum margin in 30.02sec – though no one was certain until the judge called it. KrugNinety Five ran on well to take third. It is her second Irish Derby, having taken the event with Razldazl Billy in 2006. She had alsowon the English Derby with Shanless Slippy in 1996.